ASK ABOUT 3- OR 4- PERSON RATES! DEPOSIT OF $100/CABIN DUE AT TIME OF BOOKING. FINAL PAYMENT DUE 7/10/17. 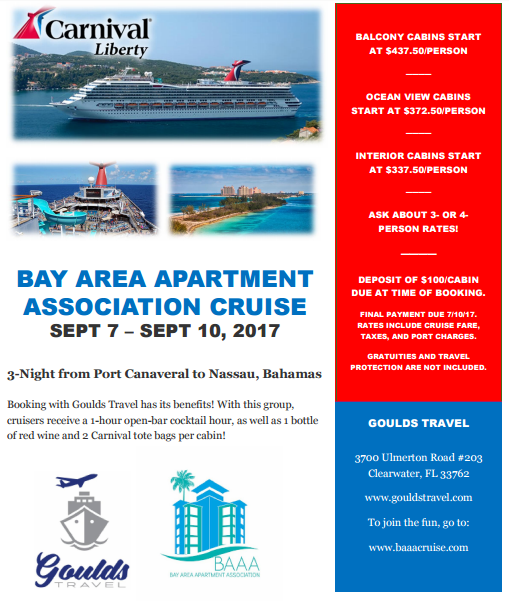 RATES INCLUDE CRUISE FARE, TAXES, AND PORT CHARGES. GRATUITIES AND TRAVEL PROTECTION ARE NOT INCLUDED.